Education has changed a lot over the last couple of decades. Institutional based education is still present. However, there is more focus than ever on learning at home, continuing one’s education, and using the Internet for the glorious information tool that it is. Childhood is particularly important for learning. We obviously can’t do all the work as every child is different. However, we’re hoping that these learning apps for kids can help! Don't miss out on learning, adults! Here are some learning apps for you too! Let's face it, reading is good. There is no doubt that strong reading skills help just about everybody. 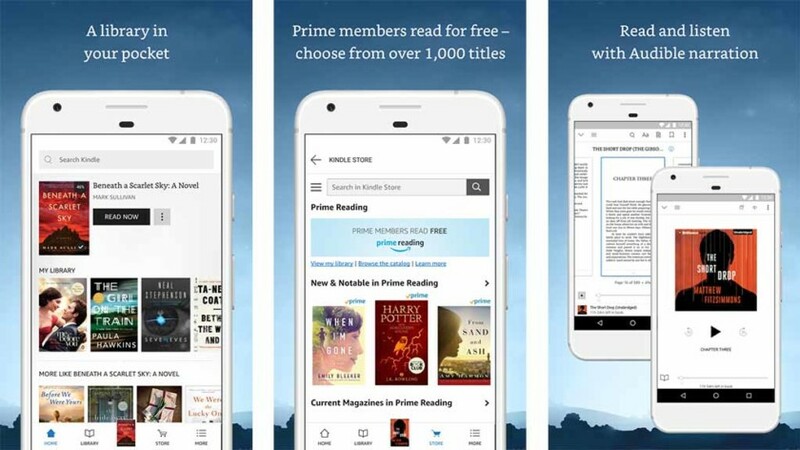 Amazon Kindle is about as stable of an eReader platform as you can get on mobile. It also includes a ton of books that are both kid and adult friendly. They also have a ton of books that are in the public domain and are free to download. Perfect for a the budding reader who's just learning how to do it. Pick it up, get your kids some books, and give them so good reading skills. It's definitely one of the really good learning apps for kids. Those who aren't fans of Kindle can also check out Google Play Books or Nook. ClassDojo is one of a few virtual classroom style learning apps for kids that we’re going to talk about on this list. Using this app, parents, students, and teachers can all interact with one another. Teachers can communicate with children about their educational needs, parents can stay up to date on their child’s education, and kids can get the attention they need in order to get a better education. Unlike many, this doesn’t replace the classroom experience but acts more as a positive reinforcement and communication tool to help keep everyone on the same page. The only downside is that you'll need to find teachers who would want to use this kind of tool. Edmodo is another excellent tool that does most of these same things. We highly recommend either one. Cram.com Flashcards is a study app. It allows you to create flashcards about any subject. This is a great study aid for pretty much anybody. The app features cross-platform syncing, access to over 75 million flashcards that others have made, and it works both offline and online. The free version gives you two folders. Each folder can have up to 100 flashcards. Those who go premium can create as many folders as needed. The only downside is that it's fairly expensive to go premium. However, if you only ever need to study two or fewer subjects at once, this is a good way to go. Duolingo is one of the best learning apps for kids when it comes to learning a new language. It has a variety of languages supported, including Spanish, French, German, Italian, Dutch, Irish, Danish, and even English. What makes the app so great is that it's completely free to download and use. There are no hidden fees and the in-app purchases are entirely optional. The developers boast that 34 hours in this app is equal to a semester at a university. It's effective, it's fun, and it's free. The DragonBox series are a set of educational games that help kids learn basic math fundamentals. There are five learning apps for kids in total. A few deal with algebra and geometry. All five of them deal with numbers to some extent. Math gives people a lot of trouble so it might be good to start young when teaching these concepts. All five games require an up-front payment, but none of them have in-app purchases. It's a good little series to check out. You're halfway there! Here are some more good apps and games for kids! Google Classroom is another virtual classroom environment. Like Edmodo and ClassDojo, it lets parents, kids, and teachers interact with one another. Students can interact with other students, upload files, turn in assignments, and more. It connects to Google's Classroom web platform. Thus, it has the kind of quality you'd expect from Google. It's definitely one of the best learning apps for kids. However, it is a large scale kind of thing. Your whole school will probably have to sign up for it in order to use it. Teachers, talk to your administrators to see what they think. Khan Academy Kids is the kids version of the popular Khan Academy. It features a variety of lessons and topics for kids. That includes simple math, reading and literacy, language, motor skills and development, and plenty more. It even has sections for critical thinking, emotional lessons, and some other types of stuff. The app has a bunch of adorable little animal characters to make it feel friendly. The controls in the app are super easy for both parents and children. This is likely one of the best free learning apps for kids anywhere on Google Play. Parents can use it as can teachers. It works for everyone and there are no in-app purchases or advertisements. PBS has been long known for their educational content. That content is available on Android via PBS Kids Video. Since they are educational, parents shouldn’t have a problem letting their kids watch practically anything on this app. Additionally, since everything is a cartoon and fun, kids most likely won’t mind watching it. There is also an educational goal tracker so parents and kids can keep track of everything the child should be learning. It's one of the more under-the-radar learning apps for kids. It's also totally free with options to buy additional shows if you want to. Pocket Code helps teach kids how to code. Obviously, this one isn't for younger kids, but rather older ones. It shows you how to program, how programming works, and some basic programming logic. It sounds complicated, but it's not that bad. The app employs a visual learning style so kids can drag and drop and see what they're doing. It can be fun if your kid enjoys technology. The app is made by a non-profit organization and is free to download. YouTube Kids is a spin-off of the traditional YouTube application that is made and curated especially for kids. It has educational videos, entertainment content, and more that are specifically chosen for young minds. It’s not available everywhere which is sad, but the regular YouTube app has all of the same content, you just have to search harder to find it. YouTube in general is a great platform for pretty much everything and it’ll be a good move to show your kids how to use it early. YouTube is still working on making sure content is child friendly. It's not a huge deal, but something to be aware of. It's one of the better learning apps for kids! Thank you for reading! Here are a couple final app lists to check out! If we missed any of the best learning apps for kids, tell us about them in the comments!